Lock in a great price for Happy Dragon. Saga Youth Hostel – rated 8 by recent guests! It was very close to the main Wangfujing pedestrian street which is the street of a huge amount of malls and shops, also kind of close to Tian’anmen Square and the forbidden city. The breakfast was good did not include the drink but still really good! The staff were really nice they knew good English and have various touristic plans. Loved Happy Dragon Saga hostel! This hostel is a real backpack hostel with friendly atmosphere, happy hours and a really nice restaurant. The facilities were great, bathrooms were clean, beds with curtains, towels provided.. the best part is the location.. in the heart of he Hutong, tucked in a beautiful alley, near the Hutong museum. Best value for money in Beijing ! I had a towel and a bathroom slippers. It was the first dormitory I stayed in that provided that. 24 hours reception and check in. Breakfast menu western style, good and reasonably priced. Right smack in.the city center and just south of the hutong areas, east of Palace Museum. 10 mins walk to Deng Si.Kou subway station. Nice lively bar with many people. My room was quiet even though there was a bar. The staffs could all speak good English, at least communicable. They were all kind and willing to help. In terms of cleanliness, towels were always fresh and smelled okay and the janitors cleaned the room everyday. The property is not well maintained, The wifi was extremely slow (most of the time was not able to access to internet) and the toilet in the room was very smelly. I went for the shared 4bed room and it was very spacious room with 4 single beds, table, wardrobe/lockers. Bathroom was nice and clean and at the ground floor is a nice bar where you can hang out and meet other travellers. The girl at the bar was quite inexperienced (i had to help her change the beer kegs and draft the beer :-D), but she was nice and was trying hard. Beijing Saga Youth Hostel is located in a traditional Chinese hutong courtyard, a 10-minute walk from Dengshikou Subway Station (Line 5). It offers free Wi-Fi in several rooms. 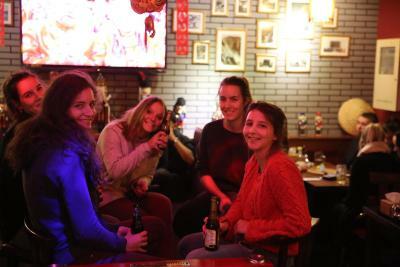 The hostel is less than 0.6 mi from Dongsi Area and Wangfujing Shopping Street. Beijing Capital International Airport is about 17 mi away. Rooms at Saga Youth Beijing Hostel come with either shared or private bathrooms. Personal safe can be used. TV and hairdryer are available in communal area. Welcome coffee and beer are offered. The hostel’s tour desk can arrange visits to Mutianyu and Jinshanling Great Wall locations. Tickets to the Peking Opera can also be booked. Delicious Western dishes are served at Saga’s restaurant. There are many local dining options available within 350 feet. 뀐 Located in the real heart of Beijing, this property has an excellent location score of 8.4! When would you like to stay at Happy Dragon. Saga Youth Hostel? The rooms are located on the 1st or 2nd floors. The rooms feature air conditioning, an electric kettle and a private bathroom. Free WiFi access is available for this room type. It is located on the 3rd floor. Offering 3 single beds, room can accommodate up to 3 guests. The rooms are located on the 1st or 2nd floors. - guests are not allowed to bring children to stay on the existing bed. This twin room has air conditioning, dining area and electric kettle. This bed in dormitory features a cable TV and air conditioning. This dormitory room has air conditioning and mini-bar. This double room features a dining area, air conditioning and soundproofing. Area Info – This neighborhood is a great choice for travelers interested in monuments, sightseeing and history – Check location Great location - show map Guests loved walking around the neighborhood! House Rules Happy Dragon. Saga Youth Hostel takes special requests – add in the next step! Happy Dragon. Saga Youth Hostel accepts these cards and reserves the right to temporarily hold an amount prior to arrival. Please kindly note that websites as Google, Gmail and Facebook are not available in Mainland China. The hostel offers free welcome beer. Please note that due to limited extra beds, guests in need are kindly required to contact the property in advance. The contact information can be found on the booking confirmation. Please note only selected twin rooms can accommodate extra beds. Please note that credit card information is for pre-authorization. Guests need to pay CNY cash upon check-in. Please kindly note that this property does not offer baby cot. Please inform the property your time of arrival if you are willing to arrive after 8 pm. Nice hostel where you can meet a lot of different nationalities. The staff talks English and is very nice and helpful. The room was nice, clean and comfortable (hot water and wifi available). 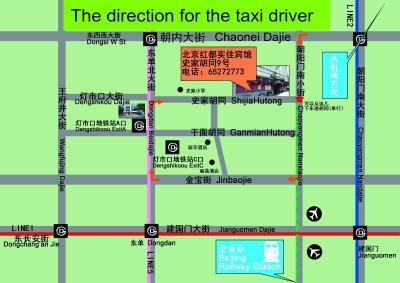 The hostel is located at 10min walk from Denshikou station and 30min walk from Dongsi. There is also a bar inside the hostel. I recommend! The room had no natural lighting. For the price we paid it was no problem, but for those that like that, may want to ask in advance for a room with such lighting. The staff was extremely helpful and kind. Toilets were quite often blocked. Air conditioning wasn't working in the bedroom and the air was stuffed. Food wasn't appealing but pricey. No lift available. Friendly and helpful staff. Comfy and spacious bedroom, we asked for a different room with a window on the outside (the previous room was having the window on the hallway). Good location. Laundry service great. Mobike every where on the way. Good WiFi. The cleaning of the room: dirty towels, my bed sheets had holes,and the worst thing was the bathroom, the joints had lots of dirt and the shower didn’t have even a curtain so each time someone of us got showered spilled all over the place, so the next one coming had a really bad moment on the bathroom. Also the heater did not work well, passed really cold nights. All very good and convenient.. Staff were very kind specially a girl called Sandra. Very good location close to station and city centre.. I'd say very good value for money.. Highly recommended. It is not that clean. 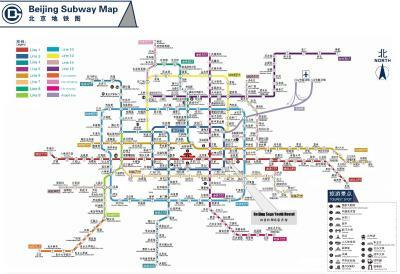 It is in the center of Peking and you can reach the next metro in 15 min. Super friendly staff! Delicious coffee! Bed was ROCK HARD. honestly it was the hardest bed we've slept on after 6 months of traveling Asia. We asked for more blankets and the house keeper automatically asked if it was to make the bed softer. We asked reception of there were rooms with softer beds and she said all rooms have the same bed. We booked the anniversary special double room but when we checked in they told us we had to have a twin room, after standing our ground we finally got a double. Tiny window and one light in a big room with dark wallpaper, very dark. Very noisy due to construction work and noisy tourists all night! Food super pricey which surprised me as its a hostel?! I wouldn't reccomend. Staff are friendly and they have happy hour but that's all that's good about this place! The beds are a little hard. Every single thing, minus the hard bed. Very good location. Really friendly girls on reception, especially Amy :) Thanks a lot for a good accomodation. Very good location. Really friendly girls on reception, especially Sandra :) Thanks a lot for a good accomodation.